Ce post a pour objectif de démontrer pourquoi et comment les règles du règlement de la protection des données à caractère personnel (RGPD) sont susceptibles de continuer s’appliquer au Royaume-Uni après le Brexit. D’une part, le RGPD a élargit son champ d’application territorial aux responsables de traitement et sous-traitant situés dans des Etats tiers. D’autre part, la responsabilisation des acteurs privés les incitera à développer les outils mis à leurs disposition pour attester de leur confirmité au RGPD tels que l’utilisation de clauses contractuelles, la mise en place de code de conduite et de règles contraignantes d’entreprises, voire la certification de certains traitements. the monitoring of EU data subject behavior taking place in the EU. In other words, having an EU establishment or the localization of the processing in the EU is not required for the application of the GDPR. Under this targeting criterion any personal data processing in the UK , will have to be in line with the GDPR after Brexit. Furthermore, the GDPR provides a shared responsability between the data controllers (including joint controller (article 26)) and the processors which could be installed in the UK. (art.28). Finally the GDPR put strong obligations for the controllers and the processors for the transfer of personal data to third countries including for « onward transfers » (art. 44). These rules will lead the controllers to a form of contractualisation of their compliance to the GDPR with the processors. Apart from these binding rules, it is most likely that the GDPR rules will apply to the UK through more voluntary private regulation. Secondly, the negotiation of this adequacy decision could take more time than expected. For all these reasons, this post will instead consider how the private sector could or should choose to benefit from compliance with the GDPR rules in order to secure their transfers. This power of the private sector to lead to the effective application of the GDPR rules can be seen as the counterpart of the new accountability requirement (5§2). « In contrast to the current EU-Data Protection Directive the GDPR requires that businesses take a pro-active, systematic and answerable attitude toward data protection compliance » as Andrew Dunlop said. In particular, controller and processor could take appropriate safeguards for data transfers in the absence of a decision of adequacy. 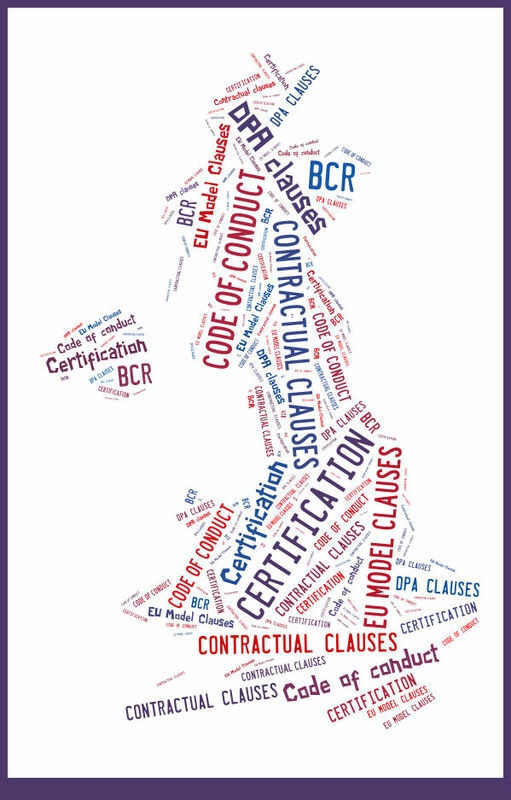 (Article 46 GDPR) such as the certification, the contractual Clauses the Binding Corporate Rules (BCRs) and the code of conduct. Most of those tools already exist in praxis. However, the GDPR has developed them, taking into account the needs expressed by the relevant stakeholders for securing their cross border data transfers. The GDRP introduces certification as a new lawful mechanism for Cross-Border Data Transfers. After Brexit, UK controllers and processors could use certification. Thus, their processing will be presumed to comply with the GDPR. However, this will not lessen their responsibility in case there’s an established violation. In addition, it should be noted that certification will only last for a period of three years. After this time, a renewal will be necessary. The development of certification is one of the priorities of the work program of several European bodies. A joint Committee of the European committees for standardization, the JW8 joint committee, was set up in order to adopt an European standard. The European Commission recently agreed the work program of this joint Committee. The future European standard should define privacy requirements for the implementation of Privacy-by design principles, for security product/services lifecycle in any business domain. This may in particular include pseudonymisation, as defined by the GDPR. This European standard should allow the compliance with the GDPR. This European standardization should be available before May 2018. The future European Data protection Board (EDPB) could used it to create a European data protection seal. The organization could also refer to national certification issued by certification bodies or Data Protection Authorities (DPAs). The EDPB should provide some coordination by facilitating the mutual recognition of national certifications. to approve criterion for the accreditation of the certification bodies. The GDPR expands the type of contractual clauses that may make cross-border data transfers lawful. DPA clauses have been introduced. These Clauses will be adopted by one or more DPAs, in accordance with the GDPR. These DPA Clauses will need to be approved by the Commission. These DPA clauses will offer a national alternative to the still-existing Commission-approved Model Clauses. The novelty introduced by the GDPR is that DPA authorization of transfers made under the Model Clauses will not be required anymore. The GDPR explicitly recognizes Binding Corporates Rules (BCR). The GDPR provides: BCRs “means personal data protection policies which are adhered to by a controller or processor established on the territory of a Member State for transfers or a set of transfers of personal data to a controller or processor in one or more third countries within a group of undertakings, or group of enterprises engaged in a joint economic activity”; ( article 4) It also provides clear provisions such as specific guidance for the list of criteria that BCRs must cover and procedures for the adoption of BCRs. Finally, the GDPR allows Cross-Border Data Transfers to be made on the basis of a Code of Conduct, which was not provided by the Directive. It may also facilitate compliance for organizations that frequently exchange data with other organizations in the same sector. cross border data transfers from the EU to the UK. Thus, these actors should take into account the new private regulation tools such as the certification, BCRs, code of conducts and contractual clauses in order to secure their processing. Much needs to be done before May 25th, 2018 for all stakeholders to be compliant. The WP29 announced that it plans to publish guidance on certification, on data transfers based on binding corporate rules and contractual clauses in 2017. This could give some useful clarification. We have also seen through various examples the importance of the DPAs in the implementation of the GDPR. The future relation of the Information Commissioner Office (ICO) with the European data protection Board and the national DPAs will certainly need to be imagined.